Affecting one in eight women in the United States, the impact of breast cancer touches nearly everyone. In honor of Breast Cancer Awareness Month, Intellectual Ventures is celebrating two visionaries in the Seattle area whose ideas about what the future holds in the fight against breast cancer is changing lives. These pioneering scientists envision a world free from the disease that takes more than 40,800 lives per year in the U.S. alone, and through their innovation and determination, are turning their vision into reality. 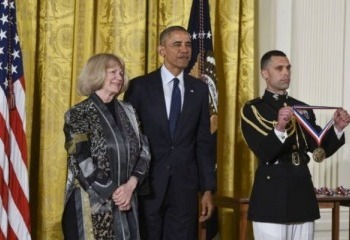 Mary-Claire King and President Barack Obama at the White House during the medal ceremony. Photo courtesy of the National Science and Technology Medals Foundation and Ryan K. Morris. A geneticist and professor of Genome Sciences and Medicine at the University of Washington, Dr. Mary-Claire King is known worldwide for her groundbreaking gene work related to human conditions such as HIV, lupus, inherited deafness, and also breast and ovarian cancer. Dr. King discovered her true passion for genetics in graduate school, where she eventually combined her innovative vision in the field of genetics with statistics and evolutionary biology to drive her work to the war on cancer. This combination led Dr. King to the assumption that certain cancers, like breast cancer, might be genetically linked mutations and not caused by viruses. Dr. King’s relentless pursuit for answers and advocacy for women’s health lead to the breakthrough discovery of the “breast cancer gene,” proving that breast cancer is hereditary in some families. This work has revolutionized diagnosis and treatment, proving that genetics and complex human disease can have a relationship, saving lives and empowering women. A passionate advocate for social justice, Dr. King has dedicated her life and science acumen to improving lives worldwide. Not always popular at the time, Dr. King’s contributions to breast cancer research were driven by the need for women to be equipped with the genetic information to make critical health decisions for themselves and their families. In addition, Dr. King has been a longstanding champion for human rights, working with organizations like Physicians for Human Rights and Amnesty International, to identify missing people and unearth human rights abuses around the world. Among her accomplishments, King developed a DNA test to help find missing children in Argentina who had been kidnapped by the Argentinian military. Dr. King later applied this genetic approach to identify soldiers who went missing in action during World War II, as well as victims of extrajudicial execution on six continents. In May 2016, Dr. King was honored by President Obama and received the National Medal of Science Award for her important contributions in advancing the fight against breast cancer. President Obama noted that “every single American should be grateful for the career path that King chose back in the late 1960s, when she was starting out in college.” We couldn't agree more. Dr. King is an inspiration who reminds us that innovation, mixed with vision and determination, can dramatically change the world for the better. Stay tuned as later this month we’ll spotlight another local visionary in our Innovating for a Cure series in honor of Breast Cancer Awareness Month. Two of the most powerful natural elements on Earth are arguably water and fire. What can stand between these two elements is often simply a tube — that is, a fire hose.